This part of my life is back in Florida (Christmas) 1998. My name is Steve Makarits, I am 38 years old and have never been married and I have no kids. It's just that I have not met Mrs right yet. 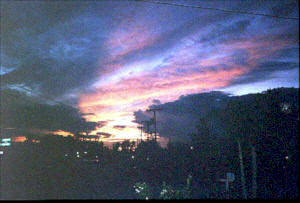 I went to see my brother, his wife and daughter in West Palm Beach Florida for Christmas 1998. While I was there my brother my dad and I went out in the ocean on his boat to do some fishing. 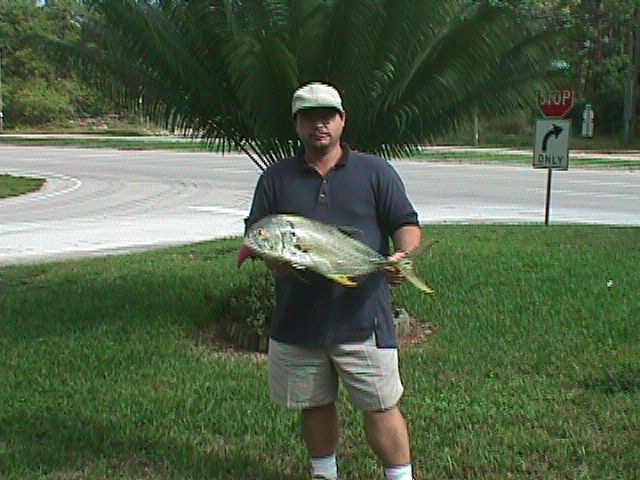 This is a picture of the fish I caught. "NOT" My brother caught it and my dad and myself held it for a picture so we could tell every one we caught it. hahah!! I stayed there for the weekend and then went to Oklahoma from there to see my dads wife to be. I worked at the West Palm Auto Mall at the Nissan Dealership there from 1990-1997. I started out washing cars, then got promoted to taking care of the used car lot and from there I went on to be a salesman for Nissan from 1993-1997. Here's an index of useful and /or entertaining Net resources in West Palm Beach, FL, organized by category. Links with places to go and people to see. Things to do for adults and kids alike. Car dealers in the West Palm Beach area. Local businesses of all categories. If you know of a local business to link here, please let me know! These Palm Beach County organizations need volunteers and donations. Don't waste your time, invest it! There is some beautiful sunsets down there. So I just threw this picture in to show you one of them. Finding a restaurant in Palm Beach County is easy with these helpful sites. Links to local colleges and universities. Also, Palm Beach County School District, grades K-12. Useful links to help you find a new job in Palm Beach County. 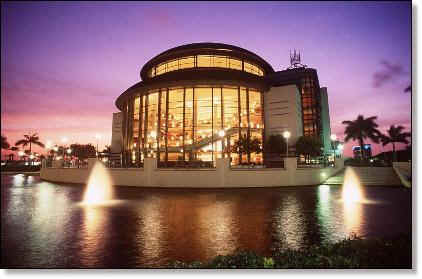 Here is the Kravis Center For The Performimg Arts. Located in west Palm Beach Florida. I went to see the Phantom of the Opera there a few years ago right after it was built. Click the picture to go to Kravis Center Home page. The Bernard and Chris Marden Stage is 150 feet wide, 65 feet deep, and has 100 feet of fly-in space. Seated at the furthest point from the stage, you are only 100 feet from the stage. The Center cost $63 million to build. The style of the building is called "formal modernism." The Marshall E. Rinker Playhouse is a 300-seat "black box" theatre. The Eunice and Julian Cohen Pavilion offers gourmet catering facilities that can accommodate 350 people. The Michael and Andrew Gosman Amphitheatre has a seating capacity of 1600. The Center's parking garage has 1,100 spaces on five levels. The Kravis Center is built on 5.4 acres of land. Local banking and financial web sites. Auto loan and mortgage information as well. Focusing on local officials - where to vote and who to vote for. Local hospitals and doctors with different specialties. Links to Palm Beach hotels and resorts, including bed and breakfast. Links to every Palm Beach County library branch. Local links to Palm Beach's favorite newspapers, TV stations and radio. If you're looking to buy or rent, the links are here. Local real estate offices including apartment rentals. Single services online and locally are listed. Matchmaking, dating, pen-pals, and room mates. Your favorite Florida teams - including NFL, NHL, and college teams. Important links to local information sites on where to play in Palm Beach.